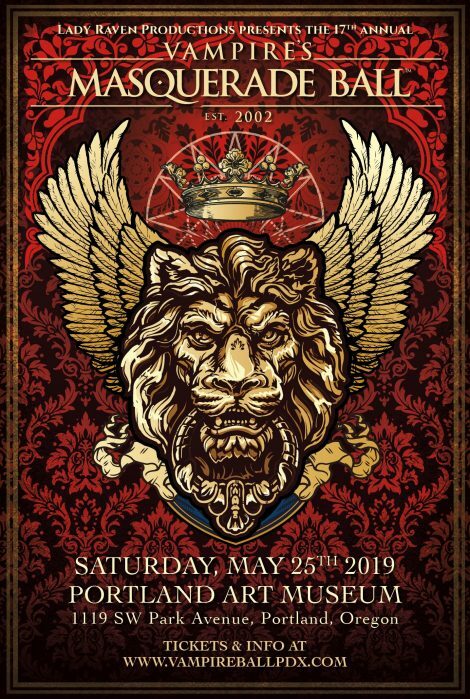 Hosted by Lady Raven Productions, Portland’s Vampire’s Masquerade Ball is a formal event of gothic elegance and decadence highly anticipated each year in the city of roses since 2002. It’s an evening where 850+ guests from around the nation and the world gather to socialize and dance the night away in their darkest and finest attire while enjoying the best in visual performances, Gothic/Synthpop/EBM dance music, regional vendors, and catering. It is the largest formal event of its kind on the West Coast. While the night is filled with DJ’s and dance music, the crown jewel of the evening is the famed Waltz at Midnight when all guests are invited to waltz with their partners on the main floor. Written and composed exclusively for the VMB, the waltz is performed live by an octet featuring members from the Vancouver Symphony Orchestra, Oregon Symphony, Oregon Ballet Symphony, and Tacoma Orchestra. [Feb 28 update] All rooms offered at the special VMB discounted rate have been booked! However, some rooms are still available, but at their regular rates and can be reserved on The Paramount Hotel‘s website. Held the night before the Ball, the Meet & Greet is a low-key meet up for out-of-towners and locals to relax and mingle. It’s a casual gathering and details to be announced in the coming weeks before the Ball. What do you mean by "Dress Code Enforced?" The VMB is a formal event and is not to be confused with ‘costume party’. Appropriate attire includes tuxedos/suits, ball gowns, corsets, period-wear (Victorian, Edwardian, Renaissance, etc. ), neo-Victorian, and formal evening gothic attire. Cocktail dresses are also appropriate. Are masks required? No, but they are encouraged. Guests wearing masks have always been around 60/40. For shopping recommendations please follow the Facebook Event Invite as we will frequently be making posts with helpful links on where to find appropriate attire. NO STREET CLOTHES ALLOWED (blue jeans, t-shirts, tank tops, etc.). Also, while some risqué outfits are gorgeous and can be appropriate given the theme, we ask that anything ultra-revealing/exotic remain at home as this is a formal event. If you have any questions regarding the dress code, please send us an email. For this year’s VMB I will be bringing you something truly unique and special for your entertainment – a production unlike any other we have done before featuring some of the very best aerialists and theatrical performers on the West Coast. You will see passion, drama, seduction, and the macabre all unfold on the grand stage in the main ballroom. More performer pictures and bios coming soon! Experience the Pacific Northwest's largest subcultural formal event before it's sold out! The annual Vampire’s Masquerade Ball (VMB) solely hosted by Lady Raven Productions is exclusive to Portland, OR. Any other events in the state or across the country with a similar name or theme are in no way related to, or sponsored by, Portland’s VMB.